4.Support Bluetooth\TF card digital player. Micro USB Jack USB Charging Connection (DC5V, ≧500mA), PC connection reading TF card, and PC upgrade. Support LCD brightness adjustment, and backlight timeout setting. Digital on-demand songs, automatic selection. 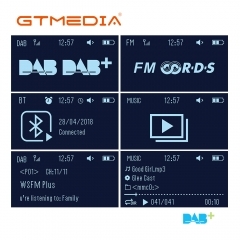 Support DAB+/FM program recording function. Support stereo earphone listening function. Support USB connection PC upgrade, and USB connection charger charging. Powered by 18650 lithium battery. DAB+ Region Europe, UK, Korea. DRC On (Half), On (Full) and off. Music Formats Support MP3、FLAC and WAV many music. Play Mode Support One Time, Repeat and Shuffle.